For the ultimate hunger attacks! 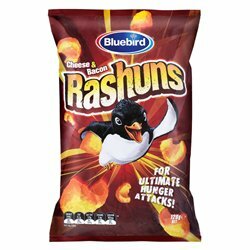 Bluebird Rashuns are puffed corn snacks bursting with cheese and bacon flavour. This 150g bag can cure the biggest craving for a snack. Husband loves em. A taste of home. Rashuns are one of the best snacks that Bluebird make! Living in the UK they remind me of my childhood and home. The bacon and cheese flavour is perfectly balanced! An awesome snack for a duvet day!!!! Always a big fan of the Rashuns. Such a nostelgic chip and awesome to help satisfy those cravings. Perfect after a night out or as party snacks. If only the Brits knew the joy of Bluebird products.